Garden Palimpsest being the first of these works. Andre Le Notre, Louis the 14th’s landscape designer, responsible for the gardens of Versailles was exposed to Islamic patterning in the studio of Simon Vouet under Louise the 13th, he was 17 years old and had wanted to become a painter this was around 1630 and I believe Versailles speaks of this influence, beyond that of the Italian Baroque. Something I have also continued throughout the carpet works are dialogues about water, of it’s scarcity and preciousness and of water in ornamental excess. In Garden Palimpsest the Grand Canal lies on top of the umbilicus of the Char Bagh beneath, the drawing here is based upon Jean Delagrife’s plan of the Versailles estate in 1746, almost a hundred years into it’s history. In Hyde Park Kashan, 1862 it is the proximity of the Serpentine and in United Kingdoms it is Kirkcudbrightshire, the wettest area of the UK that much of the stitches actually point towards. These well worn carpets suggest many hidden stories, the layers of their design heritage, or of their making and particularly of the hidden lives in their actual use. The works are part homage to the carpets at the end of their useful lives and part penance, because their making is an almost impossible task. This is more like breaking rocks and nothing like the gentle art of needle point. The garden of paradise, so central to the Abrahamic religions both as beginning and ultimate goal, is also such a potent metaphor in this time of environmental turmoil. I believe that to see the world as a garden which we inhabit and must now hold in stewardship is the best that we can hope to do. I advocate thinking of the garden as something beyond the utilitarian, as a conceptual space and dare I say it? a spiritual space. To think beyond the practicality of the farm, the park and the no longer endless bounty of the wilderness and to see everything as part of the garden for which we are ultimately responsible, having destroyed or at least unbalanced an ageing Gaia. My broader practice has for many decades attempted to consider the question of nature as a social problem. I consider myself a student of carpets and of gardens, though I have made many gardens and worked upon relatively few carpets. Formally I think of these works as sculptures and I come from a formal tradition of sculpture making, so really they ask the question “can this also be sculpture?” and of course it is. Their reversibility is fascinating for me, much of what I do is actually about taking threads away from the interference, the embroidery, and this more than anything else seems the opposite of sculpture making. That they are fully reversible and the carpets are a matrix that simply hosts this possibly temporary additional layer that pierces right through them but actually fundamentally leaves them unchanged. but perhaps the oldest example of these heterotopias that take the form of contradictory sites is the garden. We must not forget that in the Orient the garden, an astonishing creation that is now a thousand years old, had very deep and seemingly superimposed meanings. The traditional garden of the Persians was a sacred space that was supposed to bring together inside its rectangle four parts representing the four parts of the world, with a space still more sacred than the others that were like an umbilicus, the navel of the world at its center (the basin and water fountain were there); and all the vegetation of the garden was supposed to come together in this space, in this sort of microcosm. As for carpets, they were originally reproductions of gardens (the garden is a rug onto which the whole world comes to enact its symbolic perfection, and the rug is a sort of garden that can move across space). The garden is the smallest parcel of the world and then it is the totality of the world. The garden has been a sort of happy, universalizing heterotopia since the beginnings of antiquity and our modern gardens spring from that source. a restored antique Kerman carpet with dyed-wool embroidery. 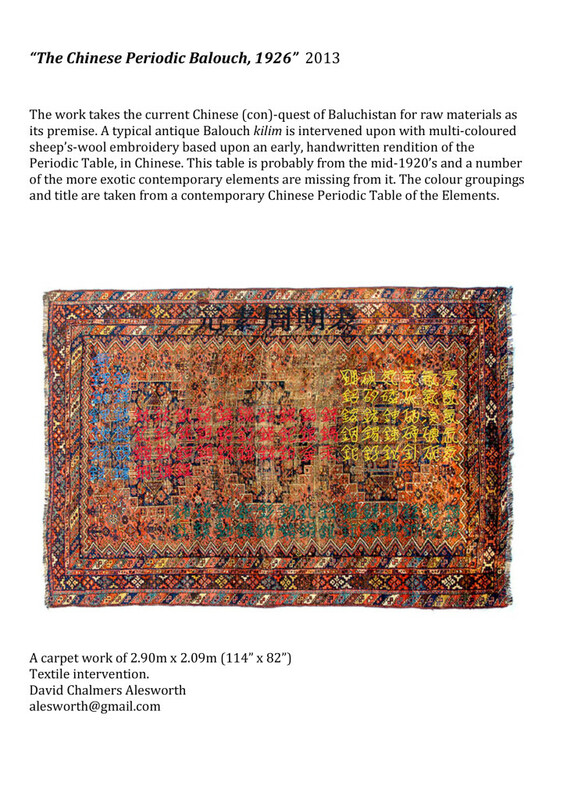 (After a Stanford map fragment of 1862) a restored antique Kashan carpet with dyed-wool embroidery. During the past eighteen months I have produced a pair of re-purposed carpet works that I refer to as “textile interventions”. In “Garden Palimpsest” 2010, I had worked with a team to embroider an image based upon Abbe Jean Delagrive’s rendition of Versailles Palace gardens in 1746: this into an ancient Kerman carpet fragment, some one hundred and fifty years old. This carpet was almost worn flat and the embroidery process was relatively easier than the work that followed. In early 2011, I completed “Hyde Park Kashan, 1862” based on a rendition of a fragment of a Stanford map from 1862 showing part of the great international exhibition of that year: this into a large seventy-five year old Kashan carpet fragment. In this case the carpet was less worn, though not as finely knotted it had a much fuller pile that involved the exclusive use of pliers on the embroidery needles throughout its production. This almost impossible intensity of manufacture imparted unique visual qualities to the resultant work. The lengthy ordeal of production becomes a form of homage to the original making and subsequent life of these antique carpets; almost a pilgrimage of penance toward a deeper understanding of the work. I do not see these western iconic landscapes as obscuring the original rug designs, rather I see them as distantly rooted in the fabric of these garden carpets, growing out of the quintessential landscape beneath.